Have you heard the story about Tony Abbott giving a surfing lesson to a refugee? It's no joke thanks to one enterprising Not for Profit. 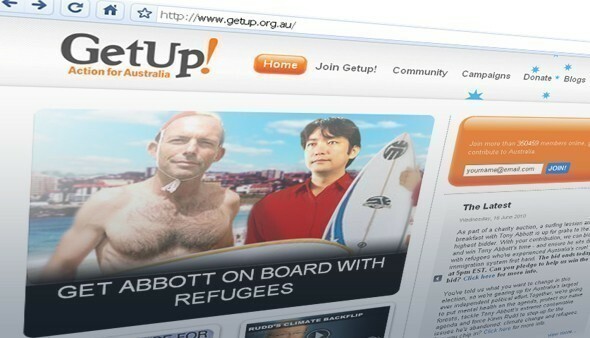 Not for Profit advocacy group, GetUp says that while Federal Opposition leader Tony Abbott wants to stem the tide of refugees entering Australia, he will instead be riding the waves with them. As part of the Canberra Press Gallery?s Midwinter Ball Charity Auction, Abbott offered a personal surfing lesson to the highest bidder. Seizing the opportunity, GetUp members say they raised over $50,000 in under three hours to bid and win the prize for Riz Wakil, a former Afghan Refugee who spent nine months in the Curtin Detention Centre. GetUp describes itself as an independent, grass-roots community advocacy organisation with the aim of holding politicians accountable on important issues. Wakil's moving story was told in a national television advertising campaign run by GetUp earlier this year. GetUp members say they have now taken the campaign one step further – straight to Tony Abbott. GetUp National Director Simon Sheikh, says Tony Abbott would have expected that he?d be giving his surf lesson to a mining magnate or corporate donor but his organisation has made sure he will hear from a different voice; sitting down with refugees who?ve experienced Australia?s cruel immigration system first hand. Wakil says he's excited about the opportunity saying the Opposition Leader can teach him a thing or two about surfing and he will teach him about what refugees go through to build a new life in Australia. GetUp members are seeing the auction result as a win-win: advancing their campaign to humanise the discussion around refugees, while also supporting charities such as Camp Koookaburra, Fighting Chance, Karinya House and Oz Help Foundation. Sheikh says if they want to change the refugee agenda in this election, they need to neutralise Tony Abbott?s downward spiral on refugees. He says Abbott?s strategy is to play to prejudice and fear. But by making him stand face to face with a group of refugees who are prepared to stand up to his campaign they can really send a message.